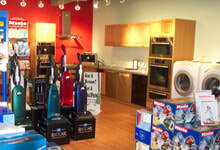 For the greatest variety of top-brand vacuum cleaners Andover MA area residents can come to North Shore Vacuum and Appliance. Our store has proudly served the greater Andover MA community since 1934. Now run by its fourth-generational owner, we continue to strive toward the principles that have propelled us this far. We have built our reputation on offering quality vacuum cleaners and sharing our expert knowledge with all those in search of the right product for your needs. Our shop is conveniently open Monday-Saturday from 9 a.m. to 6 p.m. To schedule an appointment to speak to an expert on our staff about vacuum cleaners Andover MA area residents can call ahead at (978) 774-1155.